Happy New Year everybody from the edit room at Gravity, where my partner Stanford Chang has been kind enough to let me camp out today, this first work day of the new year. I love working at home, but sometimes it feels good to get up, get dressed and really GO to work. Today felt like one of those days. So I’ve taken a personal pledge to use less plastic in 2011. I had switched to reusable shopping bags and have been avoiding taking any plastic bags for shopping for sometime. But plastic containers have slowly crept back into my life as a convenience, since they’re all recyclable, right? WRONG! Not in Hawaii. Here in the Islands, it’s not cost efficient to recycle a lot of things. The only things we can put in our curbside recycling are corrugated cardboard (no junk mail, magazines or catalogs, no paper and no chip board), glass bottles and aluminum cans and #1 & #2 plastic bottles. So all the rest of the plastic goes into the garbage can, and eventually to a landfill, or it get burned as fuel in Honolulu’s garbage to energy power plant (which provides 8% of Honolulu’s electricity). I truly hope all the tuna poke containers I tossed this year got converted to electricity, since they are made from petroleum products in the first place. But because petroleum is such a dirty business, environmentally and politically, I would rather use less, and not buying disposable plastic seems like a good place to start. So I brought my water bottle today to fill and drink from, as well as my insulated drink cup so I never have to get a Starbucks iced mocha in a plastic cup again. I brought my lunch in two clean, reused Tuna Poke containers, when I sadly realized that both of my favorite lunch places near Gravity serve all their food in #5 & #6 plastic containers. Sorry Kakaako Kitchen and Paina Cafe…I won’t be eating there any more. Ditto to the egg salad sandwiches packaged in plastic containers at Starbucks. We’ll see what the challenges are trying to run a small business…so many computer accessories come in those awful plastic packages that are nearly impossible to open, and it’s hard to know how they come packaged if you order online. I think I’ll be looking at the local office supply store for office supplies with minimal packaging. 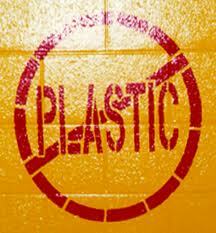 For the record, it takes 500 years for a plastic container to start breaking down in a landfill. Paper takes 2.5 months. An orange peel, 6 months. A milk carton, 5 years. A plastic bag, 10-20 years. A plastic soda bottle, 450 years. Join me. Buy less. And buy less packaging. And put it in your own reusable bag.